A very good quality French, 19th century bronze statue of a Roman Centurion mounted on a plinth base with gilded high lights. A very good quality classical Italian bronze statue of a mother and child. 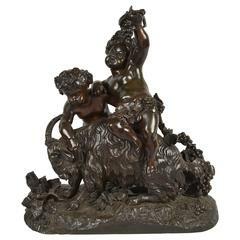 A very pleasing 19th century French Bacchus influenced bronze group, depicting two putti playing with a ram, garlands of vine leaves and grapes. Signed. A very good quality 19th century bronze statue of David standing on a rock and mounted on a marble plinth. Signed; Fernand Lugerth 1885-1915. Pair of 19th century grand tour Roman feet bronze candlesticks, each one realistically cast of one pair of human feet, that hold one standard candle. 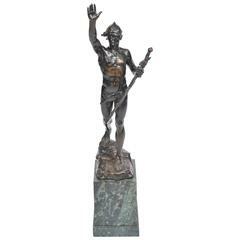 This is a fine large French mid-19th century bronze classical figure by the renowned Paris foundry F. Barbedienne. Standing on a sienna marble base, circa 1850.